When I was seven years old my grandmother made a beaded lace purse for me to carry to my aunt’s Lutheran wedding. Even with my name embroidered on it, I had no interest. I didn’t like wearing a dress and I didn’t like the purse. I left it in the toilet at the church, where my sister discovered it in horror and tattled on me. Like many GLBT people of my generation, I have a complicated relationship with marriage and weddings. They were not part of my queer and feminist culture in the 1980s. If an invitation to a straight wedding arrived, a dose of anxiety came with it. Not only could we not get married, we were often asked to remain in the closet at family weddings. We attended very special and beautiful “commitment ceremonies,” but never imagined that legal marriage would be a reality in our lifetime. The first time I saw queer people getting married was in 1989. I was working on a documentary at the GLBT march on Washington, and I was assigned to cover the gay weddings. I had private thoughts about this. Was it the best place for our energy? The AIDS epidemic was raging, and there were so many other things that seemed more important. Yet, here I was documenting a street filled with men clasping the hands of men, and women clinging to women, all taking their vows together. It was also around this time that I entered into a long-term lesbian relationship. We had a child together, and I learned a lot about our legal system and the privileges that come with heterosexual marriage. One particular incident with the medical system stands out. I was in my early thirties, and my partner’s appendix burst while we were on vacation. It wasn’t diagnosed until days later when we arrived home. This caused a frightening possibility that my partner could go into sepsis. She was rushed to surgery. At this time we were very committed, owned a house together, and had a two-year old son. We were, by all standards, married. I can remember pacing the waiting room,. The surgery was going longer than they predicted, and I was crazy with worry. When the surgeon finally came out, he wouldn’t look at me, he would only talk to my partner’s parents. At this point I was so relieved to hear that the surgery had gone well, I didn’t care that the surgeon would not talk to me. But my partner’s mother cared. I’ll never forget her yelling at that man, “Talk to HER, tell her, you need to speak to her.” At that point, he made brief eye contact with me and walked away. I wish I could say that sort of thing doesn’t happen any more, but we all know better. So now we arrive at a warm July day in 2012, where in my mailbox I found a large invitation to a traditional Lutheran wedding ceremony for dear family friends Kevin and Gerry. Wow, the whole nine yards, a big deal wedding. A few weeks after receiving the invitation, I ran into Gerry. He told me my 21-year old son had been one of the first to return the RSVP card. Truthfully, this surprised me a little. My son was extremely busy, and I hadn’t known if he would make the wedding a priority. I went home and for the first time talked to my 13-year old son about the wedding. He didn’t hesitate, he wanted to go. He added that he hadn’t been to a wedding. He didn’t say gay. I began to see the wedding through their eyes, untainted by my history. Gerry and Kevin were important people to them, they wanted to be at their wedding. So, on a beautiful Saturday in September, I found myself seated in a Lutheran church pew with my former partner. Our relationship lasted a respectable 20 years and we remain committed parenting partners. Seated with us were our two sons. The music started and we stood to watch Gerry and Kevin walk down the aisle after 15 years together, celebrated by the clergy, family, and friends. They both were beaming and tears were flowing. For me, it was at Gerry and Kevin’s wedding that I let go of the last vestiges of my apprehensions about marriage. I could see the beauty in the ceremony, with all it’s historical complexities. It was simply a beautiful moment in time, a moment to celebrate love, because really, it is something to celebrate. Well said Pam Colby. Beauty are your words. Thanks for sharing. Yes love IS something to celebrate. And Ger and Kevin’s wedding was amazing too. Thanks for a beautiful reflection. 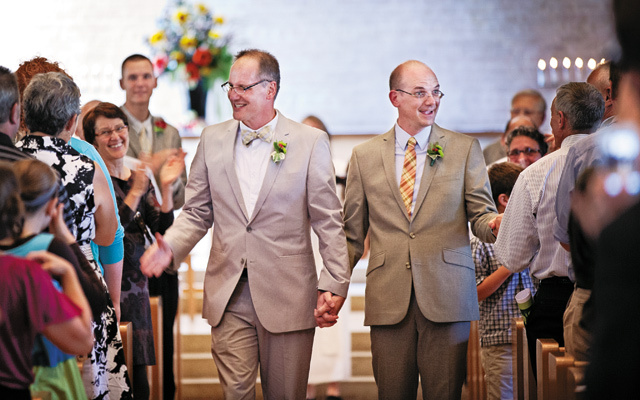 Gerry and Kevin are treasured members at Christ Church Lutheran, where we were happy to host their wedding.